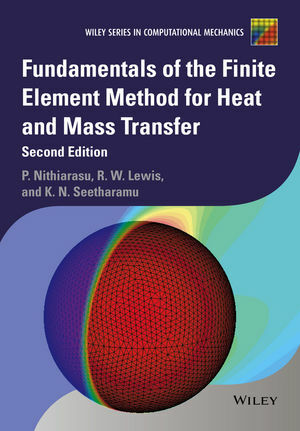 Fundamentals of the Finite Element Method for Heat and Mass Transfer, Second Edition is a comprehensively updated new edition and is a unique book on the application of the finite element method to heat and mass transfer. Perumal Nithiarasu, DSc, PhD, is currently the head of Zienkiewicz Centre for Computational Engineering at Swansea University. He has more than twenty years of teaching and research experience in the areas of finite element method, heat and mass transfer, fluid dynamics and biomedical engineering. He is a founding co-chair of the international conference series, Computational Methods for Thermal Problems (ThermaCOMP, www.thermacomp.com). Professor Nithiarasu is a winner of ECCOMAS young investigator award in 2004 and he was awarded the Zienkiewicz Silver Medal of the Institution of Civil Engineers, UK in 2002. Professor Nithiarasu has published more than 300 articles and two textbooks in the areas of heat and fluid flow. ?Professor Nithiarasu is the founding editor of the International Journal for Numerical Methods in Biomedical Engineering, published by Wiley. He serves on the editorial boards of several international journals. Roland Lewis, DSc, PhD, FREng, has more than forty years of experience in teaching, research and administration in the area of heat transfer. Previously, Professor Lewis served as the head of Mechanical Engineering department in Swansea University. ?His contributions in the areas of solidification and porous media are very well known. Until recently, he was the editor in chief of the International Journal for Numerical Methods in Engineering and Communications in Numerical Methods in Engineering. Although retired, he is actively editing the International Journal of Numerical Methods for Heat & Fluid Flow. He has also been serving as the honorary chair of the international conference series, Computational Methods in Thermal Problems (ThermaCOMP, www.thermacomp.com). ?Author of nearly 400 articles, Professor Lewis was honoured with IACM Computational Mechanics award and fellowship. He is also a fellow of the Royal Academy of Engineering, UK. K.N. Seetharamu currently holds a prestigious chair professor position in the Mechanical Engineering department of the PES University, Bangalore. He has more than forty years of teaching and research experience in the areas of heat transfer and finite element method. Previously he was a professor of Thermal Engineering in Institute of Technology Madras. ?Professor Seetharamu also has spent more than ten years in University of Sains Malaysia, carrying out research in the areas of heat transfer, energy and electronics packaging. ?Author of more than 300 publications, Professor Seetharamu is one of the top heat transfer engineers in India. He is a fellow of the Indian National Academy. Recently, the Indian Society for Heat and Mass Transfer has established a biennial award in his name to honour Professor Seetharmau's achievements.